GSTR-4 is a quarterly return that taxpayers opting for Composition Scheme need to furnish. 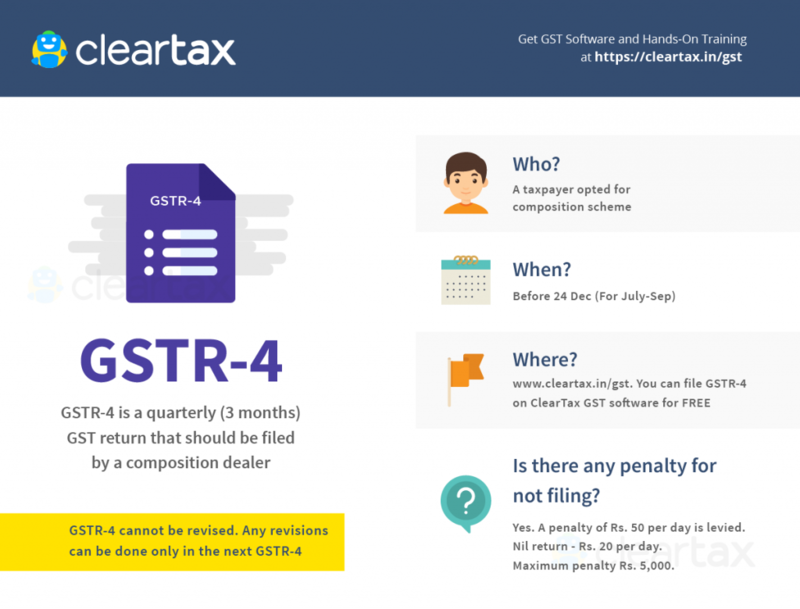 How to file GSTR-4 on ClearTax GST Software? b. When is GSTR-4 due? GSTR 4 has to be filed on a quarterly basis. The due date for filing GSTR 4 is 18th of the month after the end of the quarter. c. Who should file GSTR-4? A taxpayer opting for the Composition Scheme is required to file GSTR-4. d. How to revise GSTR-4? GSTR-4 cannot be revised after filing on the GSTN Portal. Any mistake in the return can be revised in the next month’s return only. It means that, if a mistake is made in the GSTR-4 filed for the July-September quarter, the rectification for the same can be made only when filing the next quarter’s GSTR-4. A penalty of Rs. 200 per day is levied if the GSTR-4 is not filed. Also, if the GSTR-4 is not filed for a given quarter, then the taxpayer cannot file the next quarter’s return either. As per Latest Notification No. 73/2017 – Central Tax late fees for GSTR-4 has been reduced to Rs. 50 per day of default. Also, the late fees for NIL return in GSTR-4 have been reduced to Rs. 20 per day of delay. 2. How to file GSTR-4 on ClearTax GST Software? Q. Can I revise a filed GSTR-4? A. There is no provision for revising GSTR-4. Make sure that you thoroughly review your GSTR-4 before filing. Q. Where should I declare all the B2B transactions? A. B2B transactions of a Composition Dealer are not required to be declared in GSTR-4 for July-Sept and Oct-December return. Q. Why should I declare reverse charge transactions in my GSTR-4? A. RCM on purchase from unregistered dealers has been put on hold from 13th Oct 2017. Hence RCM on purchase from unregistered dealers is still applicable up to 13th October 2017.